Jaguar Bahrain sponsored a networking event hosted by the British Embassy and Bahrain British Business Forum at the British Embassy premises in Manama. 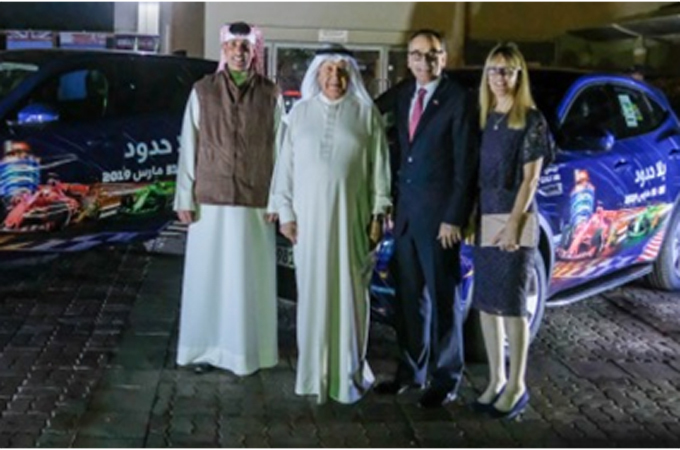 The corporate event, which brought together members of the British Embassy, Bahrain British Business Forum and Euro Motors Jaguar Land Rover, was held as a kick starter to the buildup of the 2019 Bahrain Grand Prix. The event was attended by Bahrain International Circuit CEO Shaikh Salman bin Isa Al Khalifa, along with the UK Ambassador to Bahrain Simon Martin. Guests at the event were given the opportunity to network with their peers in a relaxed environment while indulging in an exquisite dinner buffet. Jaguar Bahrain displayed the F1 branded Jaguar E-PACE and F-PACE that are being used in the Bahrain International Circuit promotional tour. Being the fifth consecutive year of collaboration with Bahrain International Circuit, Euro Motors Jaguar Land Rover has provided four Jaguar SUVs for the 2019 tour. The Bahrain British Business Forum (BBBF) is a widely recognised business group in Bahrain that works to create and sustain a favourable business environment. The BBBF strives to assist and introduce new trade and investments to both countries that can benefit and enhance the common economic interests of member companies.